Designed for general use to hold larger items. Provides easy access to small mission essentials such as gloves, goggles, extra glasses, and NVGs (works great with NVG padded inserts). Also holds full size 500-1000ml IV Bags. Five rows of T3 MILSPEC bar tacked solution dyed webbing for attachment of MOLLE compatible items. 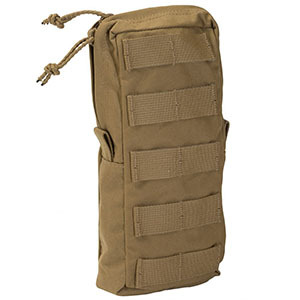 This Utility Pouch is available in 5 colors including Black, Coyote, Multicam, Desert Digital and Olive Drab.